IKOMED Technology for Treatment of Emphysema | IKOMED Technologies Inc.
Emphysema is a type of COPD (Chronic Obstructive Pulmonary Disease), an obstructive lung disease characterized by long term poor airflow. The main symptoms include shortness of breath and cough with sputum production and typically worsen over time to the point that walking up stairs or carrying things become difficult. Causes of emphysema include mostly tobacco smoking with a number of other factors such as air pollution and genetics playing a smaller role in the developing world. 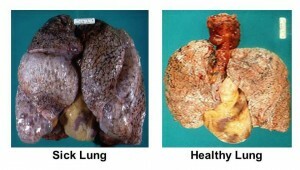 Emphysema affects millions of people worldwide and is a major cause of death. There is no cure for emphysema and treatments are targeted at alleviating symptoms by inhaled bronchodilators and steroids. Ikomed is currently developing a novel, non-invasive device that applies RF (radio frequency) radiation in a non-invasive treatment which could cure emphysema, improve the quality of life of millions of patients around the world, increase their productivity, and reduce long-term healthcare costs. Please check our Careers page for opportunities.